Carburetor hats are ideal to cover open carbs and prevent debris from falling into the engine while working in garage or pit area while the air cleaner is removed. 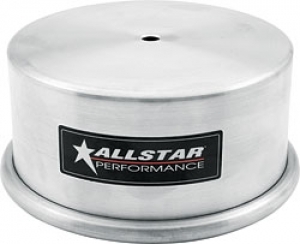 2-1/2" tall carb hats are designed to fit most carbs or throttle bodies with a 5-1/8" diameter neck. Note: Hats will not clear choke linkage or shaft on Holley style carbs but will clear choke horn with choke linkage and shaft removed.